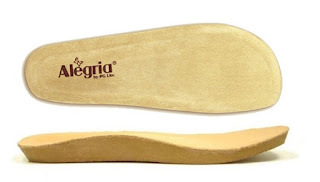 Curious about how a simple swap of an insert ACTUALLY changes the width of your favorite Alegria shoe? Keep reading to find out the 411 on these wide width inserts! If you’re an Alegria lover, you know one of the shoe’s greatest features is a removable footbed. If you have a special orthotic, if you need to replace your dirty (maybe even stinky) footbeds, or if you need to change from a medium width to a wide width, this removable insert pops right out. It’s not sewn or glued in, but instead, simply interlocks in place. What’s the difference in the medium and the wide inserts you ask? The wide insert is just a touch thinner, but only in areas that will not affect comfort or support. Trust us! We’re the Alegria shoe experts! This insert is constructed differently to drop your foot deeper into the widest, deepest part of the base. This will gain you extra width as well as additional room across your instep. Works like magic! The leather upper of the shoe remains exactly the same. This removable insert really comes in handy! Why buy a new pair of shoes when you can just change out the footbeds?! We offer a free wide set at time of purchase (make sure to select the matching size!). Of course, if selecting wide, you forfeit the standard medium insert. If you just need a replacement pair or two, we sell these online in medium and wide for $24.95. Check under our Accessories tab on www.alegriashoeshop.com. So to recap—the wide footbeds add width as well as room across your instep, in case you have a higher than average instep. Also, if you’re right smack dab between sizes, try the small of the two sizes and add the wide option. Oftentimes, this allows your foot to slide further into the shoe, allowing just enough room where your heel isn’t so close to the edge. Pretty amazing huh? Not all Alegria styles offer this removable footbed option, but most do. Happy shopping!